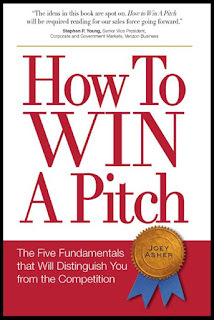 'How To Win A Pitch' is a book on sales presentations. Written by Joey Asher of Speechworks/Asher Communications Inc. this book is a great resource for people in sales especially if they deal in high involvement products and services. This book has a clear focus. It talks about five fundamentals that will distinguish your pitch from competition. The good thing is, the book stays true to its focus, from start to finish. The five fundamentals are no rocket science, absolutely basic. The five fundamentals emerge from a deeper understanding of business. Let me illustrate this with an example. What is the first thing you talk about in your sales pitch? About Us, Credentials, "Thanks for giving us the opportunity..."
Joey argues very strongly to cut the nonsense and talk about the Business Problem facing the client. Grab the attention of the decision maker and be spot on from the very start. Why talk about yourself when the prospect should be the center of your presentation? The book teaches a simple mantra for making good presentations, be prospect focused. If anything in the presentation is not related to the prospect, get rid off it. Remember, it's not about you, it's about them. Coming back to credentials. Who cares about your credentials? Your credentials will rarely differentiate you from competition. When a large FMCG client calls the top five creative agencies in the country to pitch, it very well knows that each agency is equally qualified. They are not bothered about your credentials. They are looking for something else.Read the book to know exactly what. Simple isn't it. Joey goes on to explain how each one is a true differentiator and what are steps one should take to make a winning presentation. This 260 plus pages book is beneficial because it is easy to understand and even easier to apply. The book is full of real life examples which will help you apply the principles exactly the way they should be. It's not a book which preaches, its a business book which teaches. A presentation has three elements; Content, Design and Delivery. "How To Win A Pitch" focuses more on Content and Delivery and less on Design. I would have loved to read more on what Joey Asher thinks of presentation design. May be some other time. Instead of sharing with you what else the book talks about, I would like to tease you by asking questions which you should have answers to (if you make sales presentations). Want to take the "How To Win A Pitch Challenge?" What is your answer to each of these questions? 1. Should you give away your solution to the prospects' problem in the sales pitch? 2. Should you meet the key decision makers before the pitch? 3. How do you discover what are the business problems your client is facing? 4. Should you take questions in the middle of your presentation or 'park' them till the end? 5. How will you ensure your audience remembers what you told them? 6. How do you tell stories in a sales pitch? 7. How do you present testimonials that add value and are credible? 8. How and where do you introduce members of your team? 9. How long should your pitch presentation be when you have a one hour slot? 10. Why should you avoid typing the pitch straight in PowerPoint? 11. How do you sound passionate without sounding fake? 12. How do you ensure that you don't overshoot the time? 13. How should you rehearse before a pitch? 14. How do deal with butterflies in the stomach? 15. How to avoid common blunders when you present as a team? Curious to know the answers, order a copy of the book here. This book will definitely change the way sales presentations are made. Following the guidelines laid down by Joey Asher sales presentations are going to become much more leaner, interesting and pertinent. Read it before your competition does. Also check out Joey Asher's blog at http://speechworks.net/wordpress.